Yes, these are homemade cookies. Completely homemade. Can you believe it? Our daughter was home from daycare all week, and I was out of work due to the horrible storm that was Hurricane Sandy. On the first day, just before the storm hit, I wanted to do something fun and different with her. So this non-baker chose baking. Go figure! 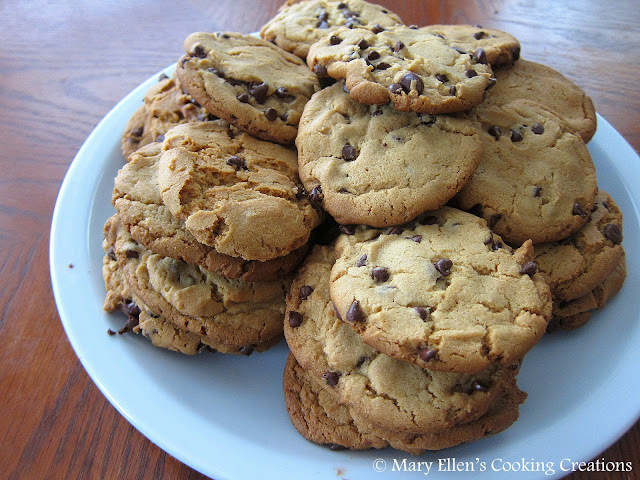 I picked this Peanut Butter Chocolate Chip Cookie recipe because it looked easy enough (hey, the web site I found it on was even called Easy Cookie Recipes), and included 2 ingredients that the little one loves - peanut butter and chocolate. They were easy to pull together, and for once all the measuring didn't bother me one bit. Seeing the look on her sweet little face as she measured, poured, and stirred made it all worth it. These cookies were really, really good, especially right out of the oven! My daughter liked them so much that I kept catching her grabbing them off the cooling rack, taking a quick bite, and then putting the cookie back! I had to turn away from her as I laughed! In large bowl, cream together butter, sugars, salt and peanut butter. Beat in eggs and vanilla and then add the flour and soda. Mix well and then add chips. Roll balls of dough and drop onto greased cookie sheet 2" apart. Flatten a bit with the bottom of a glass. Bake 10 - 12 minutes and then let cool.